Dental Implant vs Bridge. What Factors Must Be Taken Into Account? A Dental Implant vs bridge; what are the factors that you must take into account? I am frequently asked about dental implant vs bridge. When you have a missing tooth, it can be confusing! Should you just get a normal fixed bridge? Or have a dental implant? The decision is never straightforward. There are several things to think about! First of all, what is your budget? A dental implant will ALWAYS cost at least 50% MORE than the equivalent fixed bridge, usually double. So you need to find out what the costs are going to be.. Remember, it's not just the dental implant itself you have to pay for. There's the "abutment" AND the crown to take into account too! A dental implant may add up to be simply too expensive. Decision made! BUT make sure you get the FULL quotation from the dentist. You have a legal right to know all the costs UP FRONT ! Secondly, the risk of dental implant failure will be higher under certain conditions. These include things like diabetes or osteoporosis, if you smoke, and if you lost the missing tooth due to gum disease. All these things make a dental implant LESS likely to be successful. Not necessarily doomed to failure, but the risk of an implant failure are a bit higher. 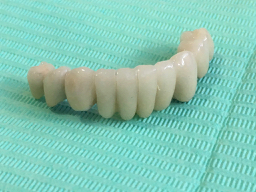 A fixed bridge might be a better option here, especially if one of the teeth next to the gap is already crowned (capped) or has a big filling. 1. You have one tooth missing, and the teeth on either side of the gap are completely healthy. They do not have any fillings nor crowns. 2. You have one tooth missing, and the teeth on either side of the gap already have caps or crowns that are supporting other fixed bridges. To do a fixed bridge in this situation, you will end up having to replace the other bridges too, because they are resting on the teeth you want to use for the new bridge! This may make the treatment complicated and expensive! A dental implant to replace a single missing tooth can be done without touching the teeth on either side of the gap. This is great if those teeth are completely healthy, without any fillings, OR are already being used to support other bridges. BUT if the teeth on either side of the gap DO have big fillings in them, then it would probably be a good idea to consider getting caps or crowns on them anyway. These can then be used to support a fixed bridge to replace the missing tooth. So you accomplish two things - you restore the heavily-filled teeth AND you get a new tooth in the gap! If you already have a fixed bridge replacing a missing tooth, there is not much point in thinking about getting an implant instead. The teeth next to the gap already have crowns (caps) on them, to hold the fake tooth. If you get the bridge taken off and an implant put in, you will still need to get new crowns on those neighboring teeth. As you can see, there are a number of things to take into account when thinking about a dental implant vs. bridge. I strongly recommend that you should also take a look at Dental Implant Pros and Cons. That page explains a lot more about the positives and negatives when you're considering dental implants vs bridge. Frequently these factors will make the decision for you!